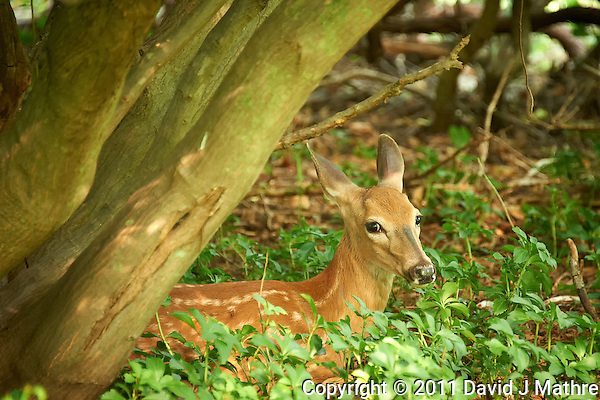 Young Fawn Hiding in the Woods. When I got home, I saw the rabbit in the same location as this morning. 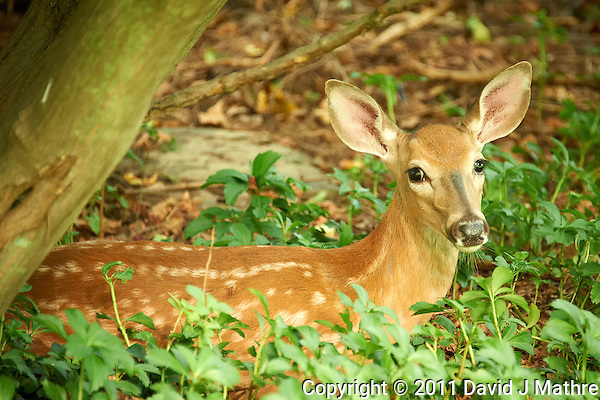 I then saw this fawn hiding in the woods. Its mother left it in the shade. It stayed perfectly still nearly camouflaged while I took some pictures. It was relatively dark in the shade, and I had to push the ISO to 1600. Even then, the exposure times were 1/25 and 1/40 sec. It is a good thing that the lens has VR such that I could get a relatively sharp image. Fawn Hiding in the Woods. Summer Nature in New Jersey. Image taken with a Nikon D700 camera and 28-300 mm VR lens (ISO 1600, 300 mm, f/5.6, 1/40 sec). Fawn Hiding in the Woods. Summer Nature in New Jersey. Image taken with a Nikon D700 camera and 28-300 mm VR lens (ISO 1600, 300 mm, f/5.6, 1/25 sec).